We have teamed with the finest suppliers and manufactures in the awning industry to bring you the finest quality awnings, solar shades and umbrellas. We have done business with many of these companies for over 25 years. As one of the largest and most well respected awning companies in the country, we could do business with anyone; we have chosen Durasol Awnings as our primary manufacturing partner. What’s better than an awning made in Vermont by Vermonters? Nothing! All of our commercial and custom stationary awnings are made by Durasol Awnings in Middlebury, Vermont. With a team of over 20 people specializing in design, welding, sewing, graphics and quality control, you can be assured that your project is being handled by professionals. Our retractable awnings are manufactured by Durasol Awnings in Chester, NY. 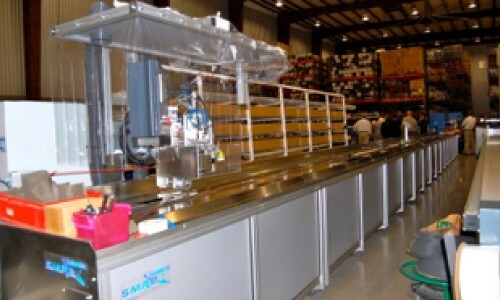 As you can see from the photo, they have a state-of-the-art manufacturing facility equipped with the finest equipment. Durasol produces awnings for over 350 dealers nationwide, and we are proud to be their #1 volume dealer in the entire country! This status guarantees you the finest quality product, with the quickest turnaround time, and the very best pricing.